'Kel Chy Un Lur' is in a tucked away location just out of the village centre at Mullion, Cornwall. 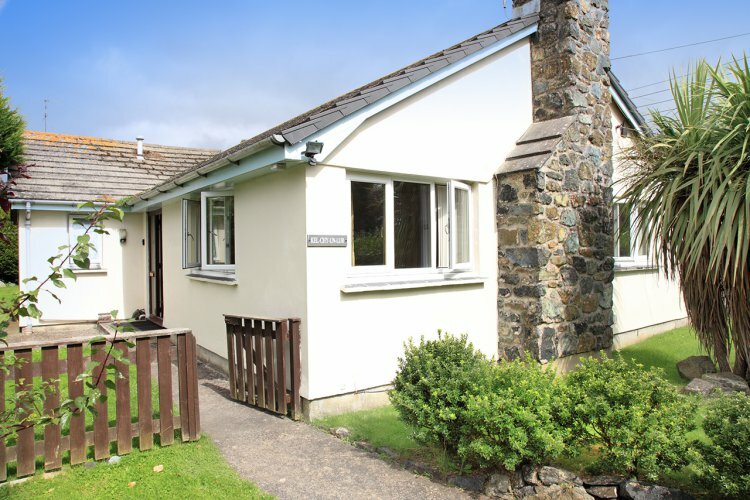 With the pubs, restaurants and shops of Mullion just a few steps away and the beautiful coves and beaches of the Lizard Peninsula within easy access by foot, car or bus, this bungalow offers great convenience and high quality. With access along a short, unmade track the house has off-road parking for up to two vehicles, dependent on size, (one in the car port). The property has an enclosed garden to the side and rear. Entered into a hallway with space for coats and hats, all other rooms lead off. The lounge/diner is a large bright room with comfy seating for six people, electric ‘flame effect’ stove, LCD TV with freeview and DVD player and Wifi, dining table with six chairs. An archway leads through to the modern well-equipped kitchen, having fridge freezer, dishwasher, washing machine, tumble dryer, electric double oven and 4-ring hob with extractor over. Double doors lead out to a patio area with garden furniture and BBQ. There is a second, smaller lounge off the hallway complete with corner sofa, music system, LCD TV with freeview and DVD player and a Wii games console (couple of games provided). There are also plenty of DVDs provided suitable for both children and adults. The master en suite bedroom has a kingsize 5’ bed, bedside tables and lamps, chest of drawers and built-in wardrobe. The en suite shower room has electric shower, matching toilet and handbasin with mirror and shaver point over. The second room is a twin with two 3’ single beds, bedside table and lamps, chest of drawers and a built-in wardrobe. The single room has a 3’ single bed with bedside table and lamp, double combination wardrobe and chest of drawers. The main family bathroom has bath with electric shower over, contemporary matching toilet and handbasin with mirror and electric shaver point over. Rental includes bedlinen, electricity and central heating. One large dog or two small dogs are welcome by prior arrangement at £25 per dog per week. Regret no smoking.